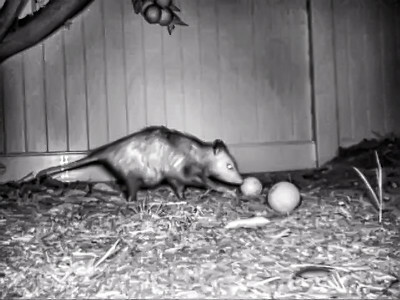 This gallery of nighttime possum videos is just for fun. Shot in infrared with a trail camera, the video quality is not great, but watching Pete the Possum do his nightly rounds has become a bit of an obsession for Priscilla and I. I put one or two trail cameras out most nights (if rain is not in the forecast) and hurry out each morning to retrieve the cameras to see what Pete has been up to. Below are a few edited videos of Pete with music included. To view a video, move your cursor to the right of Pete's picture and two movie camera icons will pop up. Simply click on one of the icons and then click on the start arrow to view a video. Enjoy!